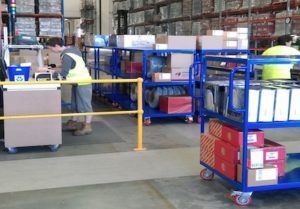 Schneider Electric, a global electrical components manufacturer and distributor, recently identified the need for custom warehouse trolleys as part of a Brisbane, Australia, warehouse process change. Bremco’s custom trolleys manufactured for the Schneider Electric distribution centre help streamlined efficiency. They contracted Bremco Metal Products, a Brisbane-based metal fabricator, to design and manufacture 35 custom warehouse trolleys for their new warehouse distribution process. To satisfy the desired warehouse process improvements, the trolleys required custom design and manufacturing to access narrow warehouse aisles. The lead-time on the trolleys was very tight with only 3 weeks from order to delivery to ensure they were ready for the warehouse launch. Bremco produced a prototype trolley within one week for review and client sign off, and the 35 final trolleys were delivered within the three week delivery deadline. Schneider’s QLD / NT Distribution Manager, Peter Dawes, was delighted with the result. 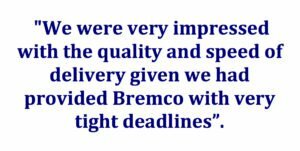 “We engaged Brenco to manufacture our purpose built warehouse trolleys because we had previously used their products and were happy with the quality. Bremco’s design team of Bretty Moody and Chris Fleck pushed the production schedule forward to ensure we could have the trolleys delivered and installed into the distribution warehouse in time for the start of our new operations process. We were very impressed with the quality and speed of delivery given we had provided them with very tight deadlines”. To find out more about Bremco Metal Products customer manufacturing, visit Custom Manufacturing website page, or Contact Bremco to speak with the friendly team.